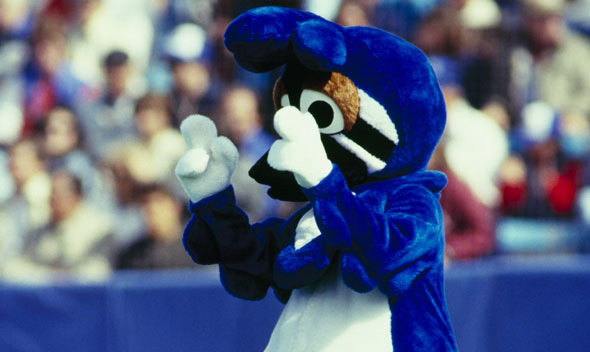 Derived from the French word “mascotte” meaning bringer of good luck, mascots have amused, embarrassed and terrified us in equal measure since the 1800s. Usually affiliated with sports (dutifully illustrated by The Simpsons in the form of the Capitol City Goofball), and meant to embody the spirit of any given franchise, Toronto has had its fair share of mascots both sporty and otherwise. Here is a primer on some of our best and worst, most of whom have already exited stage left with little or no fanfare. 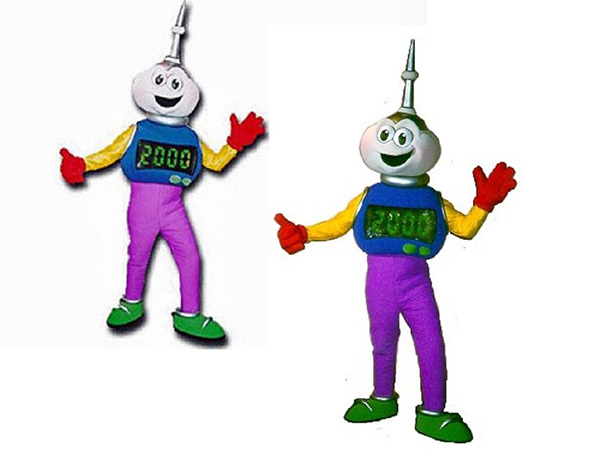 Starting with perhaps the most ill-conceived and lamest mascot of all time, meet Millenni, the cuddly Tower headed androgynous cartoon character created to help Toronto usher in the mighty year 2000. Millenni epitomized late 1990s confusion and Millennial tension, and much like the Y2K frenzy seems to have vanished into the ether of cultural amnesia as of January 1st, 2000. While those who drunkenly danced and got their pictures taken with him on New Year’s Eve 1999 at Nathan Phillip’s Square may never forget, the city quickly did. 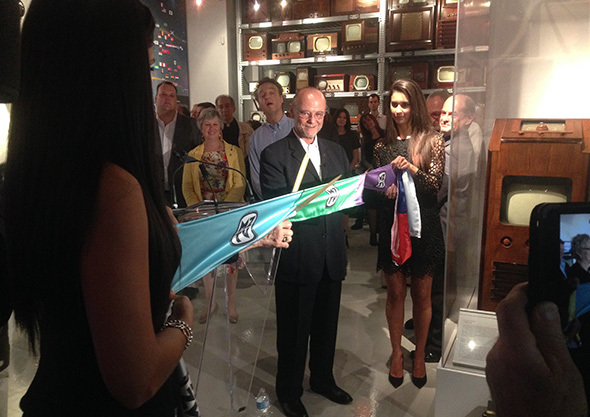 The last time Millenni made news was in 2010 when his poor origins were invoked in the spirited debate about creating a mascot for the 2015 Pan Am Games (or rather, how not to). 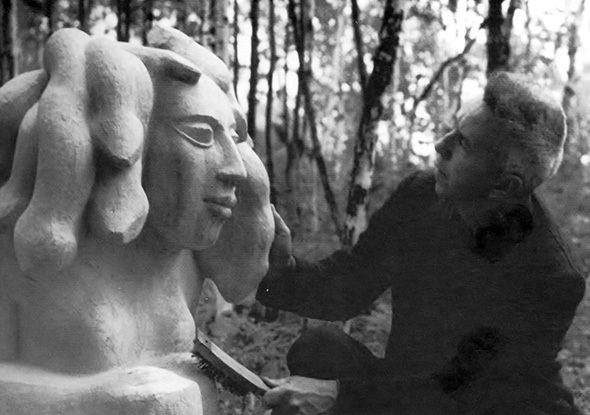 Even a scant decade after his birth, Millenni was viewed as an embarrassment best left behind in the 20th century. While McDonald’s perfectly nailed their mascot over 50 years ago with erstwhile Burger loving clown Ronald McDonald, other fast food franchises have struggled to find similarly endearing characters with whom the public might identify. 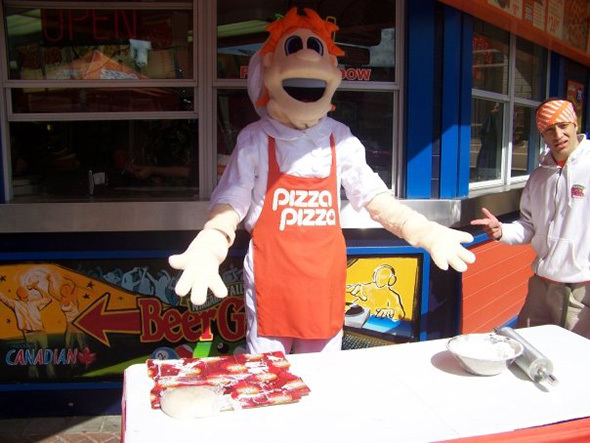 Dough Dude, the official Mascot of Ontario’s once Teflon pie chain Pizza Pizza, never quite caught on and went quietly into the night sometime in late 2007. Some might say the character’s dull name, unimaginative behaviour and lacklustre appearance is apropos to the product he’s shilling for. When Ikea Monkey mania exploded in late 2012, their long forgotten mascot Mr. Moose garnered nary a footnote. 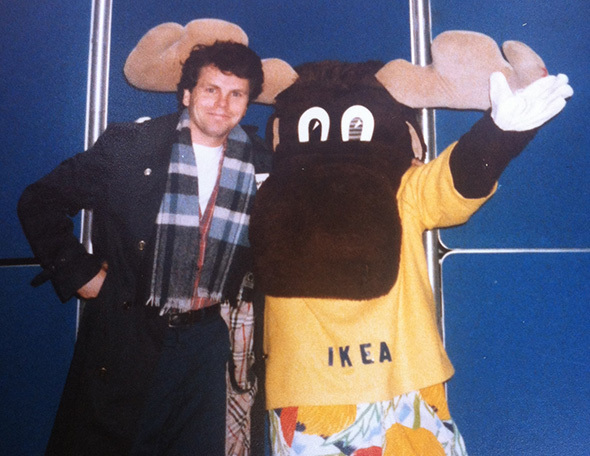 Speaking in a thick Swedish accent, Mr. Moose was often found goofing off at Blue Jays games, or marching with other mascots at the Toronto Santa Claus Parade. One that is definitely due for a comeback, although the fact Ikea never cashed in on Darwin the Monkey craze makes it doubtful this will ever happen. 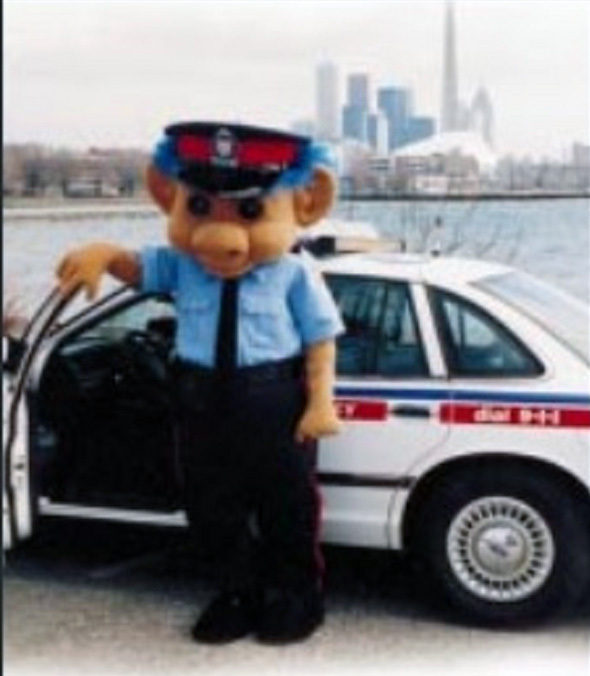 Law enforcement has had many successful mascots over the years, from McGruff the Crime Dog to Elmer the Safety Elephant, nevermind Toronto Police Service’s own legendary Blinky the Talking Police Car. However things took a turn into a slightly bizarre and terrifying realm in the 1990s with the appearance of Pat Troll, a Troll headed Toronto Police safety officer who visited schools. Pat Troll didn’t last very long, probably owing to the fact that the toy Troll craze died a death and in isolation such a character probably frightened its intended audience more than educated them. 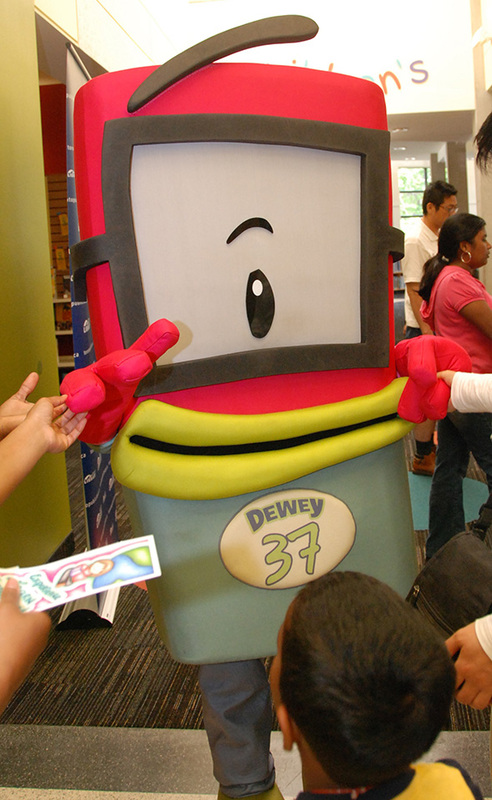 According to the Toronto Public Library’s Kidspace website, Dewey is “a robotic alien who likes Kids’ Space a lot”. He can be found at the city’s annual celebration of the written word, Word on the Street, and various Libraries around town. 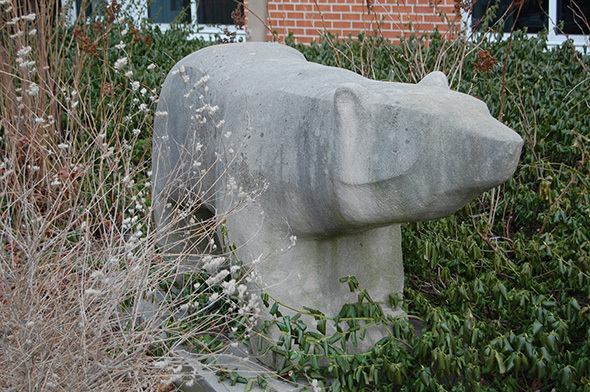 Named after the antiquated library classification Dewey decimal system, Dewey bears more than a passing resemblance to the lucrative Minions from Despicable Me, although in fairness Dewey preceded their ubiquitous arrival. 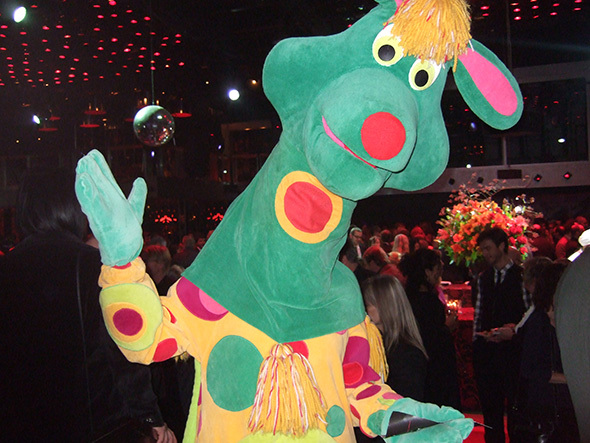 Although he began innocently enough as an imaginative and mysterious character in TVOntario’s flagship pre-school TV series Polka Dot Door, Polkaroo has since evolved into Canada’s own Big Bird, a signifier of the importance of Public broadcasting in our coarse culture. When Tim Hudak raised the spectre of cuts to TVO, many hoped for a redux of the firestorm which engulfed U.S presidential candidate Mitt Romney in 2012 after he threatened to annex funding to PBS and Big Bird became an unlikely symbol of the left. Alas, the reserve cavalry of Polkaroo wasn’t needed this election, but he’s always waiting in the wings if future nuts feint a similar war game. Toronto’s cadre of sporting mascots have always been top tier. 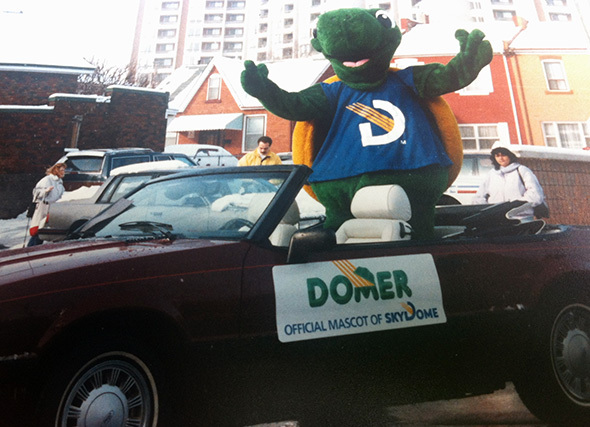 Sadly over the last few years many of the original characters have peeled away – Domer, the Nelvana-designed Turtle who helped put the SkyDome on the map in 1989 is all but forgotten but for musty plush and YouTube videos. He was wheeled out last month when the Dome celebrated their quarter century b-day, but as with how to handle Roger’s Centre original name in the proceedings, the whole enterprise seemed somewhat confused. 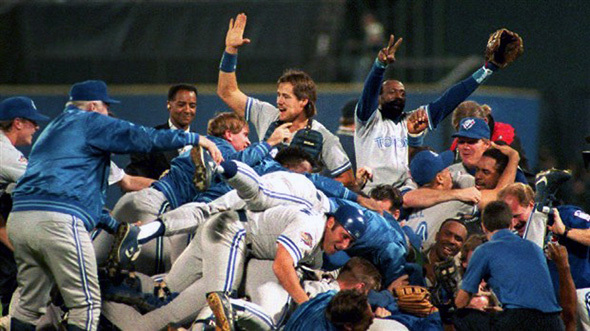 BJ Birdie’s antics thrilled Blue Jays fans spanning decades, until some kind of behind the scenes salary dispute ended his beloved reign back in 1999. Designed and played by Kevin Shanahan (who also realised the Argo’s defunct mascot Scully), BJ Birdie’s absence remains one of the franchise’s worst hangovers. His replacements Ace and Diamond (Diamond lasted a mere 3 years) lack a certain cartoonish charm and haven’t come close to matching BJ’s enduring popularity. 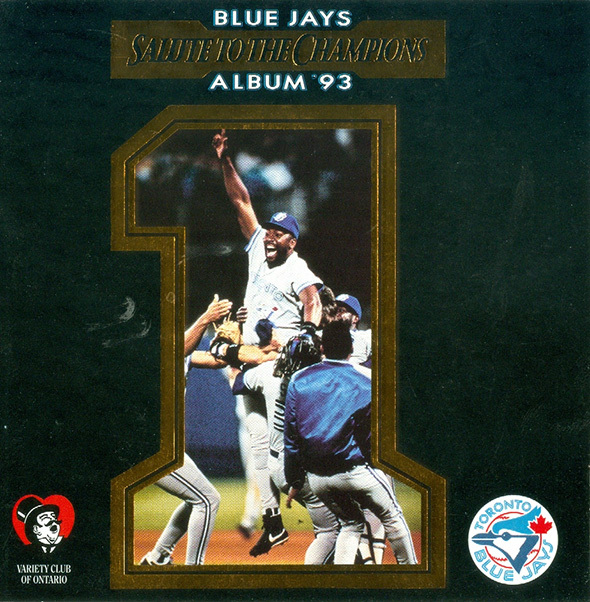 The Raptor, Carlton the Bear, and Jason the Mascot (Scully’s replacement) are still around, but like all mascots have struggled to stay relevant and most importantly aid the kind of lucrative licensing boons their forerunners engaged in during the pre-internet age. 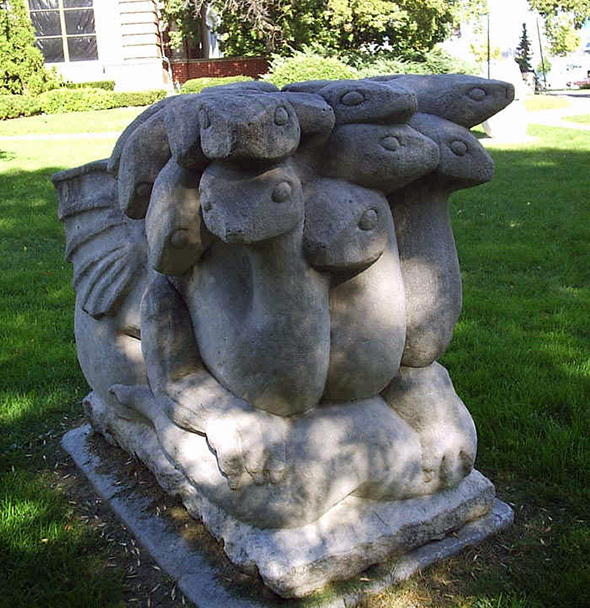 Sesqui the Sesquicentenary Squirrel was selected to be Toronto’s mascot for its 150th birthday celebrations in 1984, roundly defeating runner up T.O Hog, who pretty much ruined his chances by squealing loudly through the City council debate on the subject. 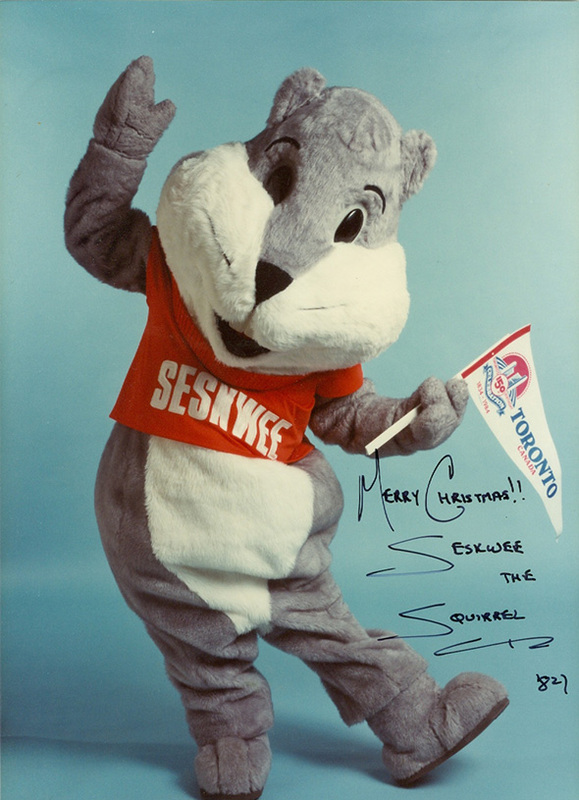 The immensely popular Sesqui (or Seskwee) appeared throughout the city at many functions in 1984, culminating in a massive b-day jam at Nathan Phillips Square, whereupon he retired and was rumoured to be resting up in hibernation for the city’s 200th birthday celebrations. 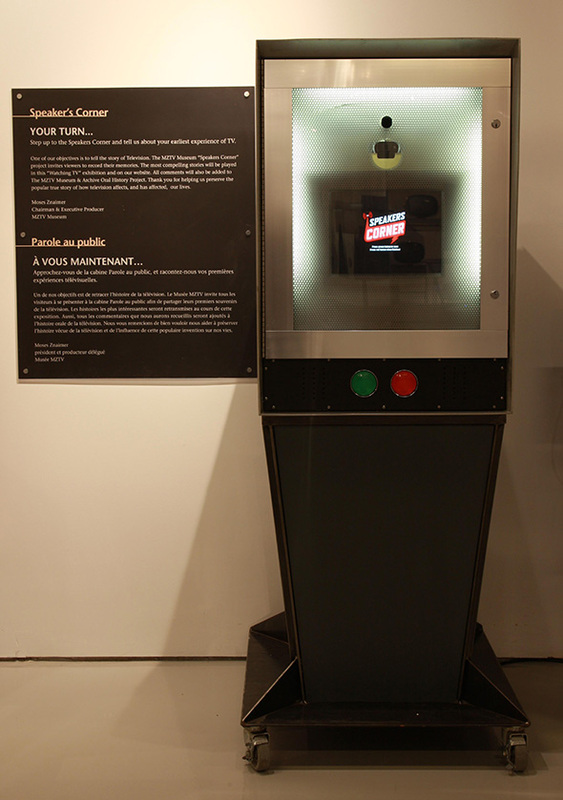 Time will tell if Sesqui is destined to make an encore T dot appearance in 2034. 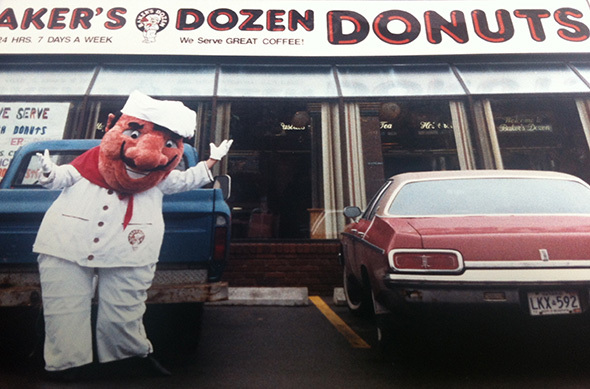 Other memorable mascots of the city’s past include Skywalker the CN Tower’s frightening clown on stilts, TTC’s friendly giant beaver Barney, Bob the Baker, mascot for the sorely missed donut chain Baker’s Dozen, and countless strange others whose lifespans were either fleeting or promptly forgotten. 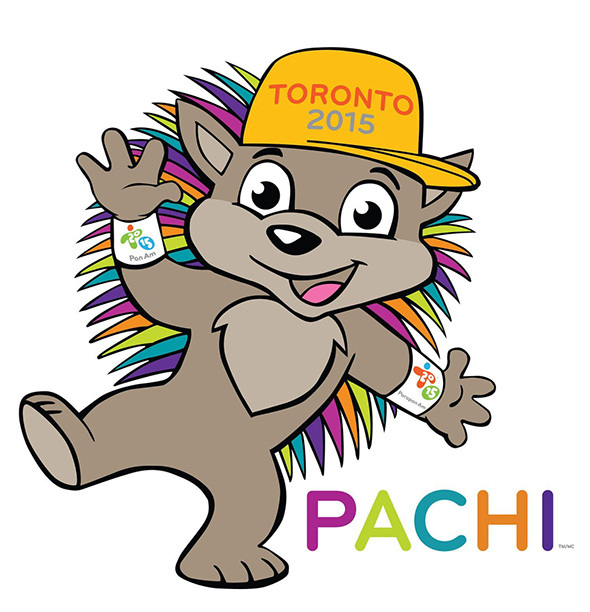 Pachi the Porcupine, mascot for the 2015 Pan Am games, is the newest member of the pantheon of Toronto mascots, and probably hopes to be remembered as more of a Sesqui than a Millenni. PJs (or Program Jockeys to the uninformed) began to appear on YTV in 1991, helping to fill out precious time between programs where advertising could not be sold, and to bolster the Canadian content quota mandated by the CRTC. 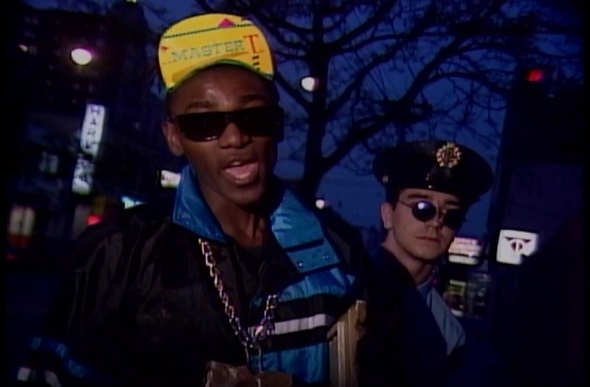 It didn’t take long for the first crop of PJs like Jazzy Jan (Janis Mackey Frayer) and Gord the PJ Man (Gordon Woolvet) to catch on and develop cult followings, but it was the fortuitous arrival of one Phil Guerrero aka PJ Phresh Phil that triggered a seismic shift in YTV’s image, vibe, and street credibility. 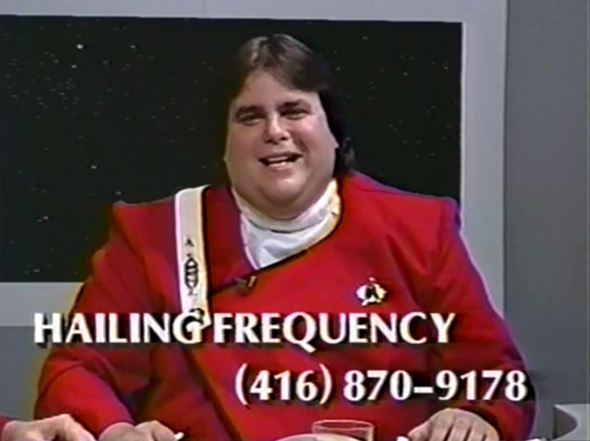 When YTV launched in 1988 they billed themselves as “the spirit of youth”; now they had a Reverend to preach it. 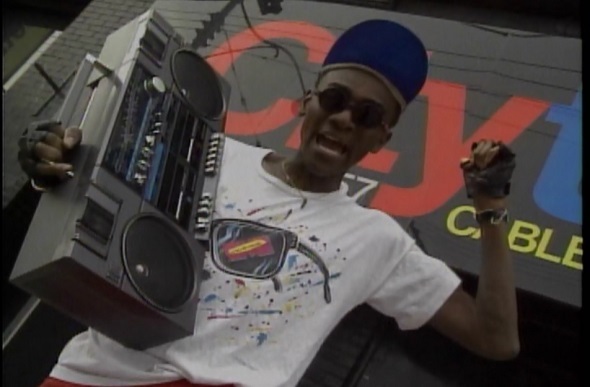 By 1993 the PJs were the face of YTV, and after great success with 1992 Canada’s Wonderland set Festival of Friends, PJ fronted specials outside of program blocks like The Zone and the Alley began happening with greater frequency. And what better event to build a special night around than one that marketing had determined was key to kids – Halloween. The very first Dark Night premiered in October of 1993, a skin-crawling twenty years ago. Featuring a triple helping of Are You Afraid of the Dark? along with special Halloween themed episodes of shows like Rugrats and Garfield, the evening was hosted by PJs Phil, Jenn and Ashna in a darkened and cramped candle-lit set. Proving to be a massive ratings success, Dark Night 2 followed in October of 1994 and was sponsored by Smarties , who provided glow-in-the-dark sleeping bags while the PJs promoted sleepovers during the marathon of fearful episodes. Also around this time, the utterly legendary YTV Green Skull first appeared, and forever became associated with scary things on YTV, especially Dark Night. In October of 1995, YTV’s atomic creative explosion knew no bounds and the production of Dark Night 3 kicked the enterprise up several notches by shooting at Casa Loma, bringing a real sense of scale to the nominally low key PJ special events. Paul McGuire aka PJ Paul remembers “Dark Night was a big deal at the time. We were used to the small Zone studio and working with nothing, now we’ve got multiple crews, lightning rigs and dollies”. Dark Night 4 found PJs Phil and Paul wandering around the fog shrouded Toronto streets, looking for a Halloween party while Phil struggles with the fact he has become uncool while Paul’s arm has been bitten by a creature and he may be turning into a monster. In those days, YTV HQ was located at 64 Jefferson Avenue (ironically now home to Moses Znaimer’s silver foxy Zoomer empire), and the surrounding area afforded suitably creepy locations for the Dark Night shoots. “I remember getting home at like 7am in the morning, after shooting all night around YTV in the warehouses there. Before it became Liberty Village, it used to be a landfill, with abandoned buildings and warehouses. It was crazy” recalls Phil Guerrero. 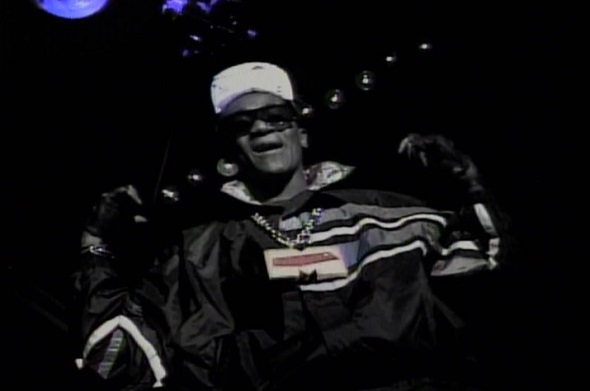 “You gotta remember, back then it wasn’t called Liberty Village, it was Lower East Parkdale. When we were shooting (Dark Night 4), in the park there were vagrants, needles and condoms scattered around on the ground, you know? It was a totally different place” adds McGuire, who fondly remembers a zealous make-up artist applying mini-sardines from a tin to create the wound effect on his arm. As the plots of Dark Night became more inspired, so did the merchandising and promotional tie-ins which became a huge part of the Dark Night experience: from YTV branded bowling ball bags for severed heads, to watches with disappearing YTV skull icon to an actual Dark Night board game. Hasbro Canada provided mind-blowingly massive prize packs rewarding eagle eyed viewers who participated in 1-800 trivia contests. One year the response was so overwhelming the jammed phone lines eventually took down New Brunswick’s network, underlining the furious passion surrounding Dark Night. Dark Night 5 in 1997 was perhaps the apex of them all, prophetically pre-figuring the reality TV/faux horror craze which wouldn’t kick off until 1999 with The Blair Witch Project and the rise of the “found footage” genre. The PJs held fort at YTV’s control room while monitoring supernatural events unfolding in a small (fictional) town called Tweed. It was as if X-Files had hijacked the Zone and transported it into the heart of Twin Peaks. Was it perhaps too much for kids to see their trusted daily hosts placed into such otherworldly peril? “There was a lot of controversy back then – if it wasn’t kids gambling with Pogs, the horror stuff was too much for them, or the Power Rangers were making kids beat each other up in the school yards. Every time we did a Dark Night we wondered if it was too scary” recalls Guerrero. Things were certainly reigned in for the following year’s Dark Night, which was not numbered and featured a monstrous game show parody from the production team behind YTV’s smash UH-OH. In 1999, Dark Night was replaced by Halloweird, and by then both Phil and Paul had moved on from YTV. 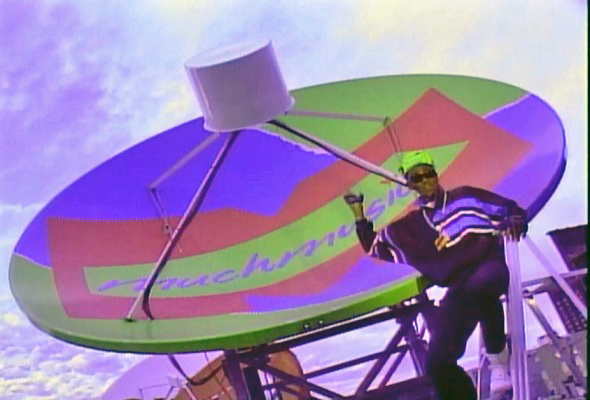 The winds of change were blowing, and those innovative and anarchic madcap ’90s YTV stylings were soon a thing of the past. Last week, home girl Ellen Page tweeted “Halloween approaching makes me remember the limitless, undying joy that YTV’s Dark Night gave me. Any Canadians in the house hearin me?” illustrating the legacy of Dark Night which lives on in the hearts and minds of ’90s kids who came of age during that innocent time before the internet irreversibly changed everything, even how we celebrate Halloween. “That was the ’90s for you…” Guerrero thoughtfully explains with a sly hint of PJ Phresh Phil sneaking back into his patois. “Great time to be a kid, lame time to be an adult”. 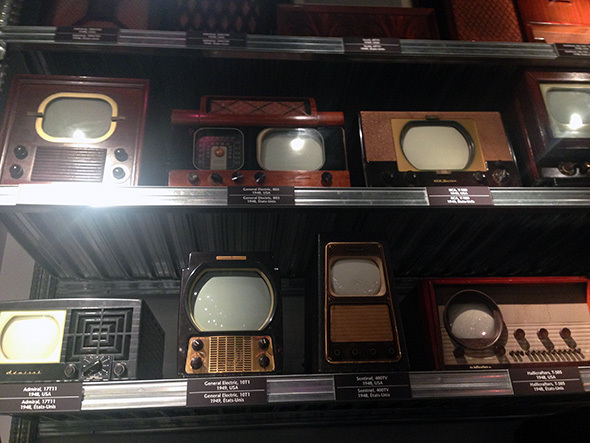 Much like the music you hear played on them, radio formats are notoriously fickle and prone to constant change. For example, rising star Indie88 might feel as if it’s been with us forever, but is barely a few months old. Now occupying the 88.1 MHz frequency previously occupied by CKLN, whose fearless hip-hop show Fantastic Voyage aided the trajectory of Canadian hip-hop by shepherding the likes of Maestro Fresh Wes and Michie Mee, the arrival of Indie88’s near perfect blend of new and old “alternative” cuts in the dead shadow of CKLN is just the latest in the long line of Toronto AM/FM makeovers, mergers, ownership flips flops and format changes. The danger with radio has always been falling in love with a particular station only to wake-up one morning to find it broadcasting something entirely different. 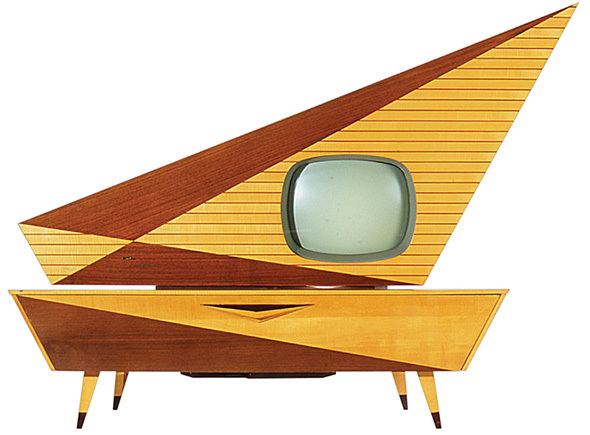 What is now Chinese language CHKT/1430 on the dial was once CKEY/590, Toronto’s “good as gold” easy listening station. 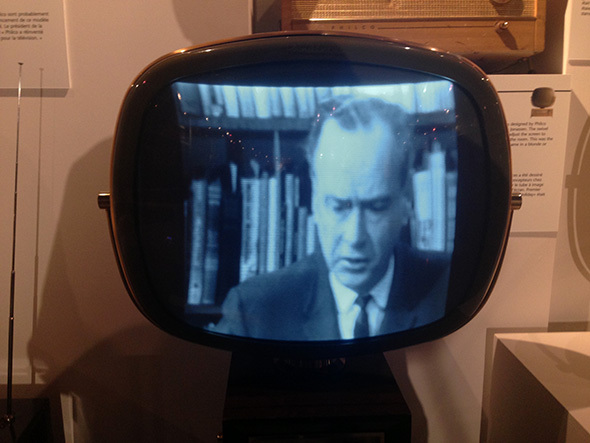 Once a leading Top 40 competitor to powerhouse 1050 CHUM, CKEY went “MOR” (middle of the road) in 1965 and beefed up its news and editorial voice. 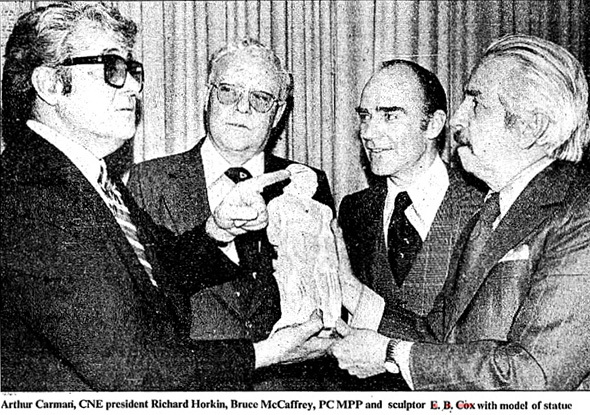 From 1970 until the early 1980s, CKEY employed the likes of Charles Templeton, NDP leader/Citytv social crusader Stephen Lewis, and Canadian history boffin Pierre Burton. At one point in the ’70s off the back of their stellar news team, rumours abound that CKEY would switch to all news, a novel concept which didn’t end materializing in Toronto until CFTR transformed into 680News in 1993. On January 1, 1984, CKEY re-branded to “Solid Gold CKEY”, ditching the MOR format in favour of full fat soft rock/oldies, appealing to a growing tide of oldies lovin’ baby boomers who were underserved in the Toronto market at the time. While Boomer partiers gravitated to the harder nostalgia of Q107, amazingly not many stations were playing the likes of Motown, Bill Haley and Simon & Garfunkel. Anyone who visited a dentist’s office in the ’80s no doubt recall hearing the calming yet toe tapping sounds of CKEY. 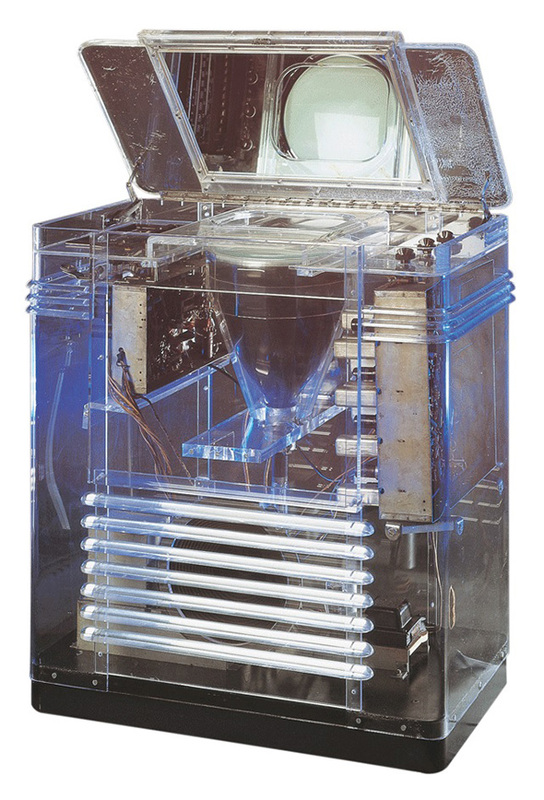 Fierce competition from old rivals CHUM arrived in 1986 when they also switched formats to oldies, re-christening themselves as “The New 1050 CHUM AM. Suddenly Dentist’s offices had choice, and poor old CKEY found themselves lagging (indeed, rock radio scrapbook refers to CKEY as a perennial bridesmaid). 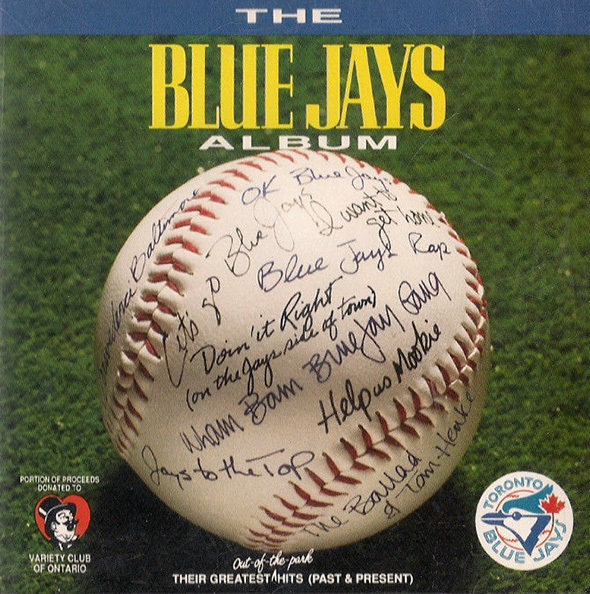 On June 20, 1988, CKEY became “Key 590” and fully embraced the oldies format, jettisoning any remaining adult contemporary styling that had survived the rebrand as suddenly that format was crowded with the likes of CJEZ FM soothing out Toronto with easy listening jams. As the ’80s drew to a close, CKEY was suffering a major identity crisis. In March of 1991, CKEY became CKYC “Country 59”, adapting a country music format which was flattened by a Dixie flag emblazoned Mack Truck the following year in the form of CISS-FM, Canada’s first Country FM station. By the mid 1990s, CKYC slid to 1430 on the dial, while sportsradio CJCL inherited the more listener friend 590. In 1997, country was dropped in favor of an ethnic format which stayed in one form or another to this day. There are some great legacy sites out there that remember CKEY and go much deeper into the classic jocks and side-burned, plaid wearing characters that made it so memorable, including CKEY Memories which is pretty much the definitive collection of the station’s colourful history. At its best, CKEY’s rainbow over Toronto imagery summed up the good vibes their broadcast exuded, with smooth music, nice people, breaking news and humane commentary. 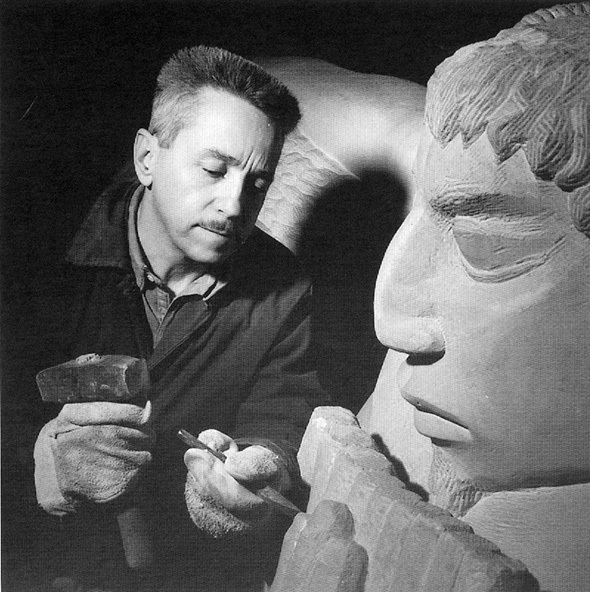 Even all these years later, CKEY is missed on the dial. Murdoch Mysteries kicks off its new season on Monday night with a salty sea-bound whodunit that not only showcases how polished this homegrown chestnut has become during its seven years on air, but also serves up a slice of legit historical Canadian rolled gold – the S.S. Keewatin, last of the great lakes passenger steamships. In “Murdoch Ahoy“, erstwhile Toronto police detective William Murdoch (played as always with great relish by perennially smiling ladies man Yannick Bisson) and his guv’nor the craggy ginger Inspector Brackenreid (Coronation Street veteran Thomas Craig) are called in to investigate when the maiden voyage of the S.S. Keewatin comes under threat after a Death and the Maiden card is delivered to the ship’s greedy industrialist owner. Opting to stay aboard during the trip, it’s not long before murder, sabotage and Rubik’s cube-shifting motives distract Murdoch from his true passion – Dr. Julia Ogden (the ever classy Helene Joy). Since premiering on Citytv in 2008, Murdoch Mysteries has revelled in its genre splicing mojo – equal parts Conan Doyle murder mystery, Sci-Fi infused police procedural, steam-punk revisionist Toronto travelogue and lush period romance. When Rogers cancelled the series in 2011, CBC’s head of English services and now Twitter Canada supremo Kirstine Stewart smartly rescued it (“Murdoch Ahoy” contains a brilliant Twitter reference, no doubt a shout out to their esteemed saviour). While the series always felt awkwardly out of place amongst Citytv’s trash glitterati reality shows and sub-CW teen dramas, it fits like a glove on CBC – pure maple flavoured chicken soup for the Canadiana soul. Over the past seven seasons Murdoch has ardently mythologized turn of the century Toronto lore, turning the aged stuff of dusty books and battered 16mm classroom films into spritely produced drama in the style of Downton Abbey by way of CSI dashed with Doctor Who, possibly with a streak of MacGyver for good measure. Initially based on the series of Murdoch Mysteries books by Maureen Jennings, local production company Shaftesbury Films have taken her cue and run with it, creating a globally recognized, cult TV brand which shows no sign of powering down anytime soon – surely a rarified feat in Canada (not including non-genre stuff like Degrassi, The Littlest Hobo or Trailer Park Boys). The S.S. Keewatin was built in Scotland for the Canadian Pacific Railway and delivered to the Great Lakes in 1907, were it dutifully served as a railway link connecting Georgian Bay and upper Lake Superior railheads for over six decades. When in the mid-1960s its sister ships were either scrapped or long sunk, the Keewatin escaped a similar unkind fate when it was purchased by an eccentric Michigan collector who brought Keewatin to the small town of Douglas, Michigan ultimately docking on Lake Kalamazoo. 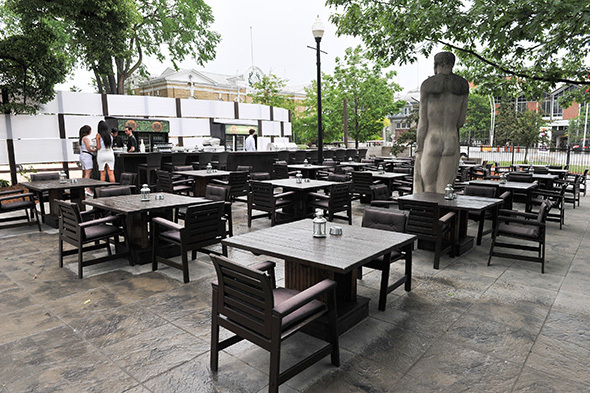 Purchased by Skyline Hotels & Resorts in 2012, an equally eccentric ex-Keewatin waiter by the name of Eric Conroy brought the ship back to its home at Port McNicoll, the once thriving Ontario hub which served as the western terminus of the CPR’s Georgian Bay and Seaboard Railway, connecting to its Ontario and Quebec Railway, near Bethany . (Conroy has a guest appearance in “Murdoch Ahoy” as the ship’s Captain). As the Keewatin is the last of the Classic Edwardian passenger liner still in existence, older even than the much more prolific S.S Titanic, its 1900-era aesthetic is a century old set frozen in amber. “Murdoch Ahoy” takes full advantage of this almost otherworldly place, following the action from the vast expanse of the open decks down to the tiny cramped corridors in steerage to the industrial era majesty of the engine rooms. Comparisons to select scenes in James Cameron’s Titanic are inevitable, but the last laugh is that it took the CBC to do something neither Mother Nature nor force majeure could muster – sink the mighty S.S. Keewatin. Lead photo from the S.S. Keewatin webpage.